Racism in real estate: Landlords, redlining, housing values, and discrimination. Racism is still rampant in real estate. 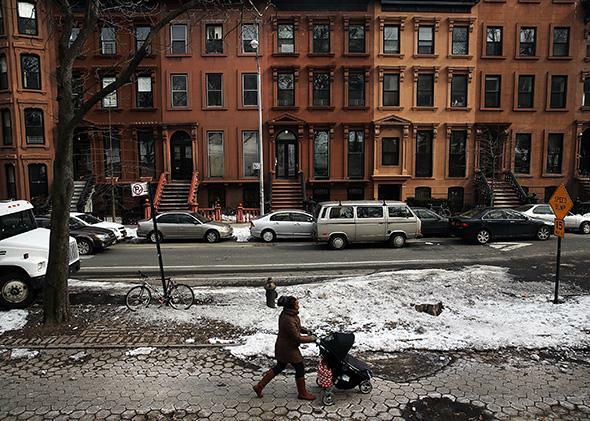 A woman and child walk down a street on Feb. 27, 2014, in Brooklyn, New York. Hoyt, as chief economist of the Federal Housing Authority, wanted to improve the accuracy of real-estate appraisals so that an affiliated agency—the Home Owner’ Loan Corporation, established by the Home Owners’ Refinancing Act of 1933—could standardize the process for making mortgage loans, avoid undue risks, and bail out homeowners who lost their homes in the economic crash. Working with Hoyt at the FHA, the HOLC would map cities and divide neighborhoods into various risk categories that were based on his ethnic hierarchy and coded accordingly. A “green” neighborhood was white, affluent, Anglo-Saxon, and appropriately Protestant. A “blue” one had less desirable whites—Jews, Irish, and Italians—but was stable and upwardly mobile. A “yellow” one had undesirable, often working-class whites, and a “red” one was predominantly black or Mexican, regardless of wealth or class. And in these “redlined” areas, loans were either expensive or nonexistent, forcing families to rely on speculators and private sales by unscrupulous homeowners. This is obviously racist, but it’s also unsurprising. As the Hoyt story shows, this discrimination is in the DNA of American real estate. For most of the last century, lenders and brokers—including national realtor organizations—used race as a proxy for neighborhood value. “Appraisal manuals,” writes Pietila, “continued to repeat Hoyt’s hierarchy until the 1960s … implying that the groups lowest on the ladder were detrimental to housing values.” These manuals also pushed realtors and homeowners to use private agreements—called covenants—that forbade sale to “undesirable” neighbors. Housing discrimination is illegal, and most Americans express egalitarian beliefs on race. But while unused and largely forgotten, Hoyt’s hierarchy retains its symbolic force in housing markets, albeit in diminished and simplified form. Indeed, real-estate racism helps illustrate the extent to which culture is built by institutions and individuals, in interactions that reflect on each other. These institutions, private and public, didn’t cause racism in housing markets, but they gave it official sanction, which—over time—influenced how individuals understood the value of their homes and neighborhoods. A white neighborhood was a good one; a black neighborhood, a bad one. We see this in public opinion. Twenty-eight percent of whites support an individual homeowner’s right to discriminate on the basis of race when selling a home, note researchers in their analysis of the General Social Survey, a long-running study that measures Americans’ attitudes on a wide range of topics. Likewise, when asked in 2008, 20 percent of whites said their ideal neighborhood was all white, 25 percent said it had no blacks, and 33 percent said it had neither Hispanics nor Asians. And only 25 percent of white respondents said they would live in a neighborhood where one-half of their neighbors were black. We see it in the actions of landlords and real-estate agents. Compared to whites, according to a 2013 study from the Urban Institute and Department of Housing and Urban Development, black renters learned about 11 percent fewer rental units and black homebuyers were shown roughly 20 percent fewer homes; Asian renters learned about 7 percent fewer properties, while Asian homebuyers also learned about 20 percent fewer homes; and Latino renters learned about 12 percent fewer units. (There was no difference in the treatment of Latino homebuyers.) As NPR points out in its analysis, this wasn’t a regional problem: Researchers ran their experiment in 28 different metropolitan regions, with similar results. Put differently, they suffered a kind of tax that reflects the stigma associated with blackness, independent of wealth or status. It doesn’t matter how rich the inhabitants are. If a neighborhood is black, other groups don’t want to live there, hurting the value. And on the other end, while we tend to associate gentrification with poor minority neighborhoods, the reality is a little different. According to a Harvard study on Chicago neighborhoods, full gentrification only happened in low-income neighborhoods with substantial white populations, 35 percent. If there’s an equally substantial black population, around 40 percent, the process either slowed, or stopped altogether. Don’t fool yourself into thinking the Brooklyn landlord is a New York problem. He is just a dramatic example of a dynamic that happens in neighborhoods across the country, in subtle, often imperceptible ways. Realtors discourage black and brown buyers; lenders charge higher rates to them; and towns use exclusionary zoning to block subsidized housing and multifamily dwellings, excluding huge groups of low-income people (and not just minorities). Despite the laws we pass and the values we say we have, discrimination is part and parcel of how Americans do housing. It’s how it was 100 years ago, and it’s how it is now.